Correct me if I am wrong but the other word for seaweed is "미역", the word "김" is usually used for fried seaweed (kinda like nori, the one used in food like sushi). The reason why it was named "김" was because the fried seaweed was found/made by a someone with the surname "김". Also fun fact the word "김" is taken from the word "金" which can mean gold and it is also a popular surname in Korea. you can take this and rice and make 김밥, hence the name. I although think "미역" is a better translation for "seaweed". 미역 is pure seaweed, but 김 is actually "laver" (although many English speakers, including myself originally, are unfamiliar with this word). 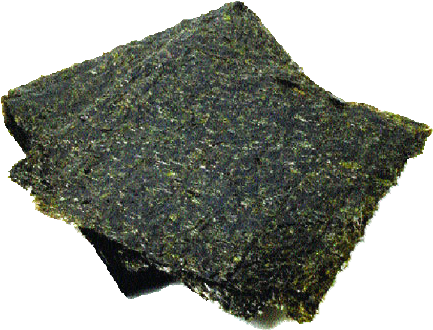 김 / laver refers to processed seaweed, put into sheets, seasoned and dried. It's what is used to make 김밥, sushi rolls. Seaweed gets 해초 (don't have a clue what you mean by "pure seaweed"), 김 is laver though that's more a Welsh thing, just dried in this part of the world not fried like in Wales. 미역 or 다시마 I'd call (soft- and hard-) kelp. 톳 I dunno, but Wikipedia seems to prefer the term sea vegetable, though it's also advised not to eat too much of this . . .